Kate and I would like to thank you all for the support you gave to the campaign, writing to the Council, attending the public meeting, signing petitions, distributing leaflets… etc. None of that would have been achievable without you and this is a great example of local democracy we should all be proud of. I thank the Labour party, the Libdems and PCS who helped us to provide the more than 20,000 leaflets we distributed since November 2008. I thank also the Councillors of Northcote ward along with the Councillors of Latchmere ward who have shown great concern and encouraged everyone to express their view to the Council. It is now confirmed that the Clapham Junction planning application has been formally withdrawn by the developers (Metro Shopping Fund). Cllr James Cousins thinks on his blog that “with the developer’s withdrawal the application will not be considered by the committee“. However I hope that there will be discussion about the matter as it has created an unprecedented level of objection for an application apparently encouraged by the Council a few years ago. “The Fund has worked hard with your Council and other consultees to put forward a comprehensive scheme which addressed fully the key objectives of your Council. We are deeply disappointed therefore that the report to the Committee was not able to give the proposal its backing. “We have invested significant resources to date, however in the absence of the council’s support at the last moment we have been forced to withdraw our application. We believe a project of this scale would have helped to stimulate the wider London economy while providing lasting benefits for all local stakeholders including job creation and improved infrastructure. Have Metro decided they stand more of a chance when there is not so much political pressure on conservative councillors to be seen to be doing the popular thing? After next year’s general and council elections perhaps? 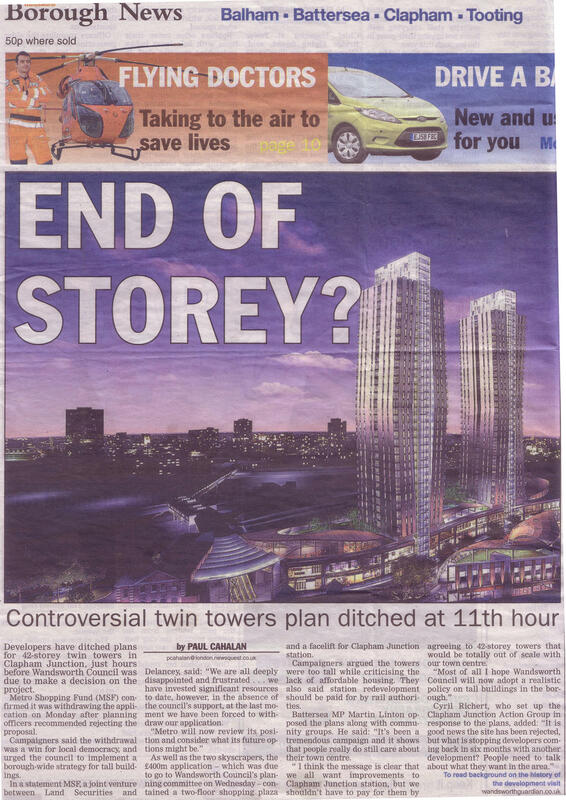 Is it a trick to avoid a debate on tall building which would have certainly aroused on Wednesday on tall building policy, and avoid the chance of setting a precedent? All in all, in either the Planning Officer’s report and in MSF’s letter, we learn the same thing. Whilst we appreciate that the Planning Committee is expected to be a neutral arbiter, it is quite clear that the planning department itself has been most encouraging of this type of proposal. This is admitted at page 46 of Mark Hunter’s report where he makes clear that metro initially proposed only to develop the Stop Shop but that the Council asked them to go back and consider a ‘holistic approach’ to include station refurbishment. It is also clear that several different designs for the flats (monolithic block, three towers and then two towers) were consulted on and agreed with planning officers. 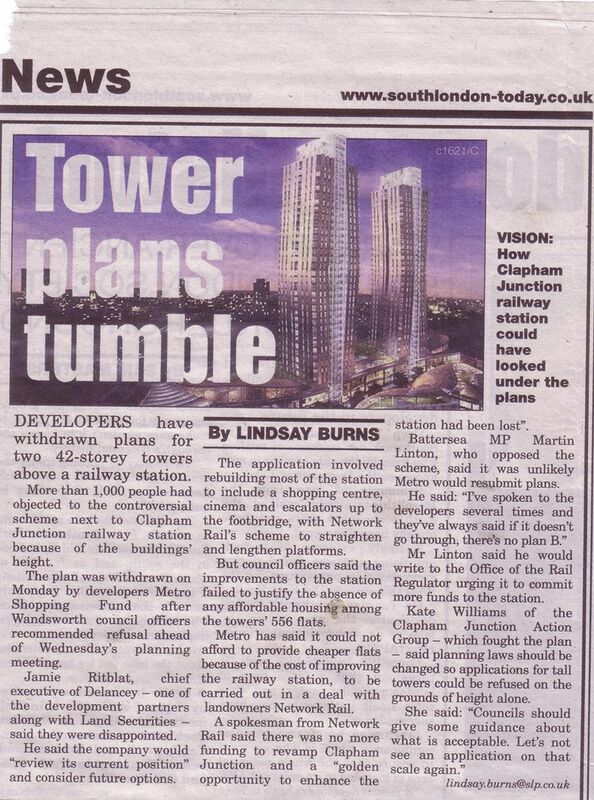 On the other hand, while it appears that everyone wants improvements to Clapham Junction station, 1,000-plus local residents have made the effort to tell the Council their objections (by letter or signed petitions) against the scheme including the 42-storey towers. It would be a shame to let the debate die on this issue when so much interest has been generated. It is now the task of the Council to answer their concern and make sure that we do not face a similar case (with a modicum of affordable housing provided) in 2 months, 6 months, 1 year or more. It is clear that the planning department have been encouraged by Council policy to seek out such schemes. Is there any way that the Council meeting on Wednesday can be used to move a motion that the Council reconsider its strategy on tall buildings for the site/the borough? Be certain, we will be looking forward to the response! Below is a letter sent to the Planning Committee members (copy all Councillors), in response to the Planning Officer’s report on the Clapham Junction redevelopment proposal. We have read with interest the Chief Planning Officer’s report to the Committee on Metro Shopping Fund’s application to develop the site of Clapham Junction Station. Naturally, we welcome its conclusion that the application should be refused on grounds that insufficient Section 106 commitments have been made, first through the lack of any affordable housing, and second through inadequate commitments to develop the station. We have argued in our own Planning Submission to the Committee that, since the proposal involves the demolition of the existing station entrances, it can be no part of Metro’s Section 106 commitments that a new ones should be provided. 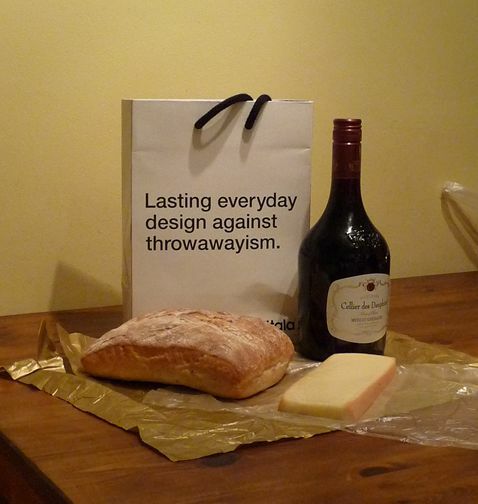 We are pleased that this argument has found resonance with the Chief Planning Officer. We would urge you to accede to Mr Hunter’s recommendation that the application should be refused on these grounds. However, in view of the unprecedented levels of objection raised which are recognised within the report, we consider that it is fundamental to the interests of the community at large that the Committee also rejects this application on the wider grounds that the scale of the proposed development is inappropriate to its location and that the proposed ‘tall buildings’ in particular are unacceptable in terms of their height and design. As Mr Hunter has acknowledged, this is the key issue for the vast majority of protesters. The report is most carefully worded in this respect, presenting a case for a design rationale having been followed in the proposal of the ‘tall buildings’. Whilst this might explain the reason why the scheme has been pursued to this late stage of design, it does not answer the many concerns people have that it will overwhelm the local community and detract from its current amenity. Contrary to the suggestion that the objectors do not give any specific reason why they do not like the tall buildings and do not consider them suitable for this location, very many people have in fact been most specific in this regard. We summarise many of these points of objection in our Submission to the Planning Committee and do not propose to repeat them here. Suffice to say, the majority of the population are not architects and can give no comment on detailed aspect of the design. They are non-the-less horrified that proposals of this inhuman scale and garish appearance could possibly be given the go ahead no matter what benefits might be realised in terms of the station’s re-development. We urge you to act upon this suggestion and to incorporate into your decision the resolution that the scale of the proposed development is inappropriate to its location and that the proposed ‘tall buildings’ in particular are unacceptable in terms of their height and design. Any decision which is not made on these grounds will fail to represent the true outcome of the Council’s consultation and leave the developers with the impression that adding some affordable housing to the design will overcome the Council’s objections. Notwithstanding the role that the Council might have played in encouraging a proposal of this nature on the site, the time has come to recognise that this was a mistake and that any redevelopment of the site should be on a far more sympathetic scale taking account of the location’s natural and unique purpose as a transport interchange and its opportunities for attracting business. 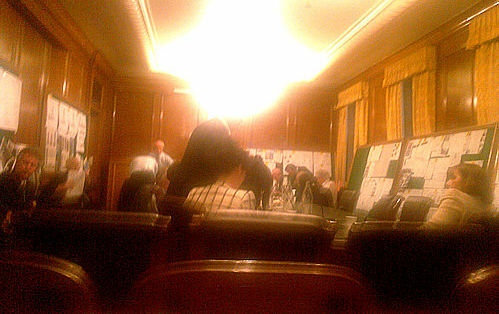 The fact that the current economic climate means that the current application is unlikely to proceed in the near future, gives the Committee an opportunity to rethink its strategy and invite a wider set of proposals from both Network Rail and other developers to develop the site in a manner of which we can all be proud. Parking: this is probably the second most cited reason for objection amongst protestors. Metro’s proposals are contradictory and rely upon flawed assumptions. Full details are provided in our Submission and are in no way answered by the Chief Planning Officer’s report. Retail Impact: contrary to the developers’ assertion that the town centre is declining, the opposite is manifestly the case. In spite of the current recession, new outlets are opening and pressure on businesses in Northcote Road may well be eased as rents reduce in line with economic factors. No consideration appears to have been given to commissioning an independent retail analysis in light of the changed economic circumstances. Lack of Office Space: An assumption appears to have been formed that Clapham Junction is an undesirable location for offices to locate. We consider this to be a flawed assumption based on current office provision in the area. Again, full details of our reasoning appear in our Submission. Wind Tunnelling: Of the 60 locations measured, only four are on station platforms (all on Platform 16). Two of these locations are considered to suffer from unacceptable wind tunnelling in winter, with one of them being unacceptable all year round. Contrary to the developers’ assertion that these are not locations in which people are expected to stand and wait, the opposite is obviously true. Short of proposing full cover for all platforms (to which Network Rail would undoubtedly object) it is difficult to see what amelioration could be proposed to deal with this. Disruption and Planning Blight: the scale of the proposed development ensures a minimum of three years’ severe disruption to the community, and if the plans do not go ahead immediately this will only prolong the agony. Proposals such as the Council’s exemplar scheme and the opening of a third station access at Brighton Yard would undoubtedly be delayed by these plans. For all of the above reasons, we would urge you to reject Metro’s proposal on grounds far wider than those currently proposed by the Chief Planning Officer. The opportunity exists for the Planning Committee to send a clear message based on the views of many hundreds of local residents. Any failure to do so will result in years of continued wrangling over the type of scheme which might be considered acceptable and the ways in which the community’s interests might best be served. Date: Wednesday 20 May 2009 – 7.30pm (we advise you to come earlier, possibly 7-7.15pm). 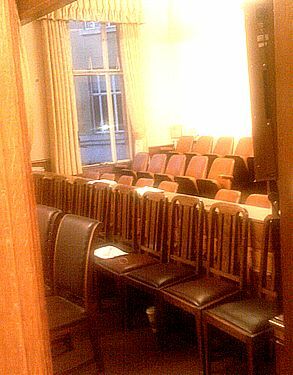 Venue: Wandsworth Borough Council, The Town Hall, Wandsworth High Street, London SW18 2PU (more details how to get there on the website). (*) I cannot assure you they will wear the same piece of clothing as on photos. Enter your email address to follow CJAG and receive automatically notifications of new posts by email.